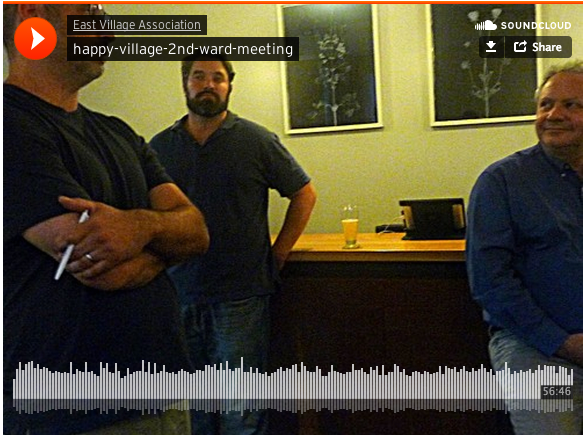 Jon Donnelly circulated this statement to East Village Association members at its Sept. 12 meeting. We respectfully are reaching out to you in regards to the sale of the Happy Village, a business located at 1059 N. Wolcott. The Happy Village has been operating for over 50 years and the owner, Cherlyn Pilch, and ourselves have come to an agreement in principal to purchase the property and business. Ms. Pilch is prepared to retire and this sale will ensure she can do so in comfort. When our attorney initially went to Business Affairs to apply for a change of officer on the license, the city told him there was a moratorium on Wolcott between Division and Augusta, which is where the Happy Village stands. We are asking for your help in lifting the moratium so that we can carry on The Happy Village's tradition and so that Cherlyn Pilch may retire comfortably. Any help in lifting this moratorium would be very much appreciated as we could complete this transaction as soon as it was lifted. We are the owners and operators of Lucky's Sandwich Co., located at 3472 N. Clark Street, which has been in business for over 10 years. All of our establishments have always been in very good standing with the city, but more importantly, with the neighborhood they serve. As for the Happy Village, we plan to carry on the tradition that has made this establishment a pillar of the community for over 50 years. Besides a few minor needed improvements to the building that will preserve the well-being of this historically landmarked building, such as general maintenance, landscaping, painting and repairs to the property, we plan on running the business as it has always run. This includes sponsoring neighborhood sports teams, hosting the Neighborhood Association monthly meetings, donating gift certificates to any and all charities, hosting fundraising events for local non-profits, and generally welcoming people from all parts of the city to enjoy one of the finest beer gardens in the city. We are very hands-on and insist on running our businesses personally. We like to know our local public officials, neighborhood representatives, associations and our everyday patrons. Joe is originally from Chicago's Northwest side and Jon has lived in the city for the past 20 years. Our experience is great and our attitudes are humble. We simply enjoy working for ourselves and running our own business. Thank you in advance for your help in this matter. With your support, we look forward to continuing the neighborhood legacy that is the Happy Village.